Welcome to my stop for a novella installment in Shelley Noble‘s Breakwater Bay series, A Newport Christmas Wedding. Please be sure to read my excerpt, check out the other tour stops, and don’t forget to enter the tour wide giveaway where TEN people will win eBook copies of the title. Continuing on from Noble’s Breakwater Bay, we pick up with the organized (and not so) chaos that is the planning of Meri and Alden’s wedding. If you haven’t read the first, I would suggest it, although this story can stand alone, the majority of the backstory and character development are in that first book, making this a wonderful continuation of the story. Each of these characters take a moment in the sun: Meri and her sudden onslaught of nerves centering on her ability to “fit in’ to this new family, and what role she will take. Alden is tired of waiting, and believes that the fates are just waiting to cause more disruption. Lucas is at boarding school, and while he isn’t in the mix of the plot full time, he is easily dragged into the story by Nora, his older sister. Poor Nora, questions that make her rethink her place in the family and remember the horrible situation after her mother’s remarriage. What could easily be solved by trusting in one another and talking things out becomes a major sticking point: and throwing everything into jeopardy. Even Gran’s solid honesty and sense of ‘what is right’ and telling it like it is doesn’t seem to resonate with anyone until she takes no prisoners and demands the stories. Ultimately – everything works as it should, with some lovely development in the secondary characters of Carlyn and Joe, and some nice insets from all of the earlier characters met in the first novel, the redemption and happy ending are a perfect fit. New York Times bestselling author Shelley Noble returns to Newport with this lovely Christmas tale featuring all the characters you fell in love with in BREAKWATER BAY. It’s Christmas in Newport. The mansions are decorated and the streets are filled with excitement. Across the bay, preparations are in full swing for the wedding of Meri Hollis and Alden Corrigan. A year ago, Meri never imagined that she would marry her best friend, Alden, or become step mother to his two teenaged children, Nora and Lucas. But as the wedding day draws near, tension and emotions run high and Meri’s happiness turns to uncertainty. Nora is suddenly acting sullen and withdrawn, Alden is preoccupied, and Meri wonders if marrying Alden will bring the family closer together or tear them apart. 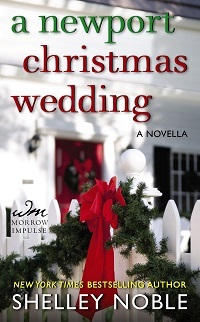 It seems like this wedding might be doomed before it begins until a special Christmas surprise brings home the meaning of family and the joy of the holidays. Nora stopped inside the mudroom door and shed her jacket and boots. They’d pretty much beaten the snow down into an icy path between Corrigan House and Calder Farm, and it had been slow going.She was cold. Luckily the heat was going, the lights were on and the kitchen was bright and smelled like lemons. Nora was still shocked every time she came home to find that the living and dining rooms in the once gloomy, dark old house were painted white, the kitchen a light yellow. Her dad had commissioned it all when he’d planned to sell last summer. Thank God Meri had put an end to that idea. Nora had been so grateful and happy then. Now, not so much. She wanted to be happy. But she was scared. Scared she’d be shoved to the background again. She guessed that meant she was selfish, just like her mother always told her. She walked through the kitchen and opened the door to the sound of vacuuming. Mrs. Miller, the housekeeper, was always cleaning. It should be annoying but it wasn’t. Nora had loved Corrigan House the way it had been, dark and never dusted. It was always a relief to visit after her mother and Mark’s perfect house in the burbs. She hoped that Corrigan House wouldn’t become like that. She’d never even seen the cleaning service from the other house. Would just come home one day and find her room spotless and everything misplaced or thrown out and it pissed her off every single time. She didn’t want to go back there. She wanted to stay here. She wanted Dad and Meri to want her to stay. They acted like they did, but . . . .
Mrs. Miller looked up and smiled and went back to her vacuuming. Nora passed through the living room, the dining room and out to the sun porch where her father worked. He was sitting at his drafting table, facing the sea. Like always, he was wearing an old white shirt with the collar cut off, the sleeves rolled up, the whole thing spattered with ink and paint. He had graphics programs that he used for some projects, but he like doing art by hand better. He didn’t notice her so she just stood on the threshold watching him for a while. She’d missed him so much. Lucas had too, though he’d never admit it. He was thirteen, out of touch with his emotions, probably. Or maybe he just kept them all bottled up inside. Kind of like their dad. “Huh?” He stopped to look a question at her. “Does she?” He turned back to frown at the picture. “I guess she does, a little. I’ve had Meri on my mind a bit lately.” He smiled and waggled his eyebrows, something he used to do when she was little and before the divorce had broken them apart. He reached for a pen. “Now let me get back to work. Mrs. Miller has been threatening all week to throw me out, so she can start preparing the room for the reception. I don’t dare stop. She might just move me out while I’m not looking.” He made a funny face that made Nora laugh. It was going to be okay. It was. It had to be.